HAVANA — In an exclusive interview with NBC News, Cuban officials forcefully denied that their government was to blame for the mysterious ailments that have afflicted two dozen American diplomats and plunged relations with the U.S. into crisis. President Donald Trump has publicly blamed the government in Havana for the reported symptoms, which range from hearing loss and nausea to memory problems and mild traumatic brain injury. But the Cubans leading the probe emphatically rejected that. "I can guarantee you that this is completely false," Col. Ramiro Ramirez, chief of diplomatic security for the Cuban Interior Ministry, told NBC News in an exclusive interview. 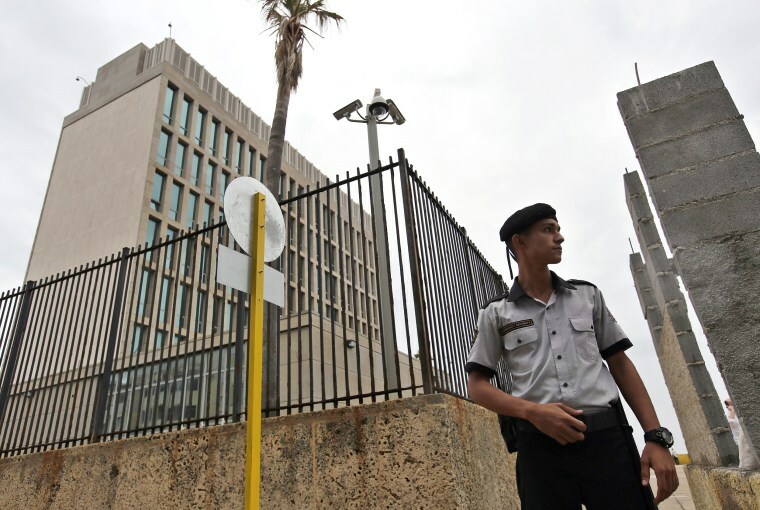 U.S. officials believe some kind of sonic weapon was used to attack two dozen embassy staffers and relatives between the fall of 2016 and this August, but the Cubans claim they don't even have that technology — and U.S. experts say they don't know of technology that would produce the reported symptoms. "Cuba has never produced these type of weapons," said Lt. Col. Jorge Alazo, head of the criminal division of the Interior Ministry. The State Department pulled 60 percent of its workers out of the embassy in Havana three weeks ago and soon after expelled 15 Cuban diplomats from Washington, or nearly two thirds of Cuba's D.C. staff. Secretary of State Rex Tillerson said the "decision was made due to Cuba's failure to take appropriate steps to protect our diplomats." The Cubans, who took the extraordinary step of inviting the FBI to Havana when the U.S. first reported the incidents, said they are doing everything they can to figure out what is behind the ailments. "This investigation has involved nearly 2,000 people," said Ramirez, "including law enforcement agents and the best scientists in our country." They have examined rooms in two hotels where American embassy staffers lived, scoured a neighborhood where many had homes, interviewed 300 neighbors, and conducted dozens of medical exams to see if others outside the diplomatic cadre were affected. "Not even one person was sick," said Dr. Manuel Villar. He noted, however, that the U.S. has refused to share the medical records of the diplomats or let the Cubans speak to U.S. doctors. The Cubans also say the State Department has not permitted them into the homes of U.S. diplomats to conduct tests. The Cubans also analyzed air and soil samples, looked into whether insects could be the culprit and considered a range of toxic chemicals and the possibility of electromagnetic waves, the officials said. But from the Cuban perspective, nothing so far has explained why U.S. diplomats began suffering health symptoms, some of them after what have been described as acoustic disturbances. "We've been unable to find anything to prove this situation exists or ever existed," Alazo said. There is audio of the strange, high-pitched sounds that some of the diplomats reportedly heard, but a document provided to NBC News by the Cubans says the recording did not capture "acoustic levels damaging to health." And American experts said they know of no technology that would explain the symptoms. "There's never been any kind of physiological response that reflects the symptoms that have been reported that has ever been caused by sound waves of any type," said Joe Pompei, a former MIT researcher who is the founder and president of Holosonics, a sound technology company. "Unless they had transducers in the bathtub and had the diplomats submerge their heads for a long time, it's just not possible," Pompei added. Despite Cuba's intense investigation and impassioned disavowals, the episode has frayed relations with the United States just two years after the Obama administration restored ties. In a classified briefing for members of Congress, administration officials did not point a finger at Cuba, U.S. officials said. But Trump has cast blame in that direction at least twice. "They did some bad things," he said in late September as the State Department began its drawdown of personnel. Two weeks later, he told reporters, "I do believe Cuba is responsible. I do believe that." In Havana, Cuban officials dismiss speculation that hardliners on the communist island orchestrated attacks in an attempt to freeze the defrosting of relations between the two countries. As for the possibility that a third country, like Russia, wanted to cause trouble, Ramirez said, "We don't have definitive answers yet but Cuba has never allowed, nor would we ever allow, our territory to be used in this way." The FBI has met with the Cubans this week to discuss the situation. Cuba says that despite the war of words, it's hoping for more cooperation that could unravel the mystery. "Let us do it together and find out what is happening," Dr. Villar said.